Since January, Vanessa Nakate has been spending Friday mornings on strike. Sometimes alone, sometimes with her friends or siblings, the 22-year-old has been protesting on the streets of the Ugandan capital, Kampala, coming in late to her job selling car batteries. She strikes at different locations around the city, one week setting up in front of a supermarket, another outside parliament buildings. But her protests have a singular focus: to draw attention to climate change and urge her government to take action. This Friday 15 March, a few friends will join Nakate. But they won’t be alone. In about 1,700 cities in more than 100 countries — from Nepal to Vanuatu — thousands of young people are planning to walk out of schools to demand that adults do more to combat climate change. “I hope the strike is just like a massive, massive wake-up call for policymakers and CEOs of massive corporations,” says 18-year-old student Ummi Hoque, who learned about the strikes through friends and social media and will join a demonstration in London. She hopes that the protests will dispel stereotypes that young people are lazy, and encourage governments to make climate change — which will have its worst effects on future generations — their top priority. And although some politicians have objected to children walking out of class, thousands of scientists around the world have thrown their support behind the movement. “The idea of a climate strike is innovative. It’s provocative, and I think it’s the right form of non-violent civil disobedience,” says Gail Whiteman, a social scientist at Lancaster University, UK, and one of many academics who have voiced their support for the strikes. The day is set to be the biggest moment yet for a grassroots movement that has developed into a global phenomenon in only a few months. Most protestors — including Nakate — have been inspired by Swedish teen Greta Thunberg, who kick-started the movement when she began regularly walking out of classes in August 2018 to sit outside the Swedish parliament in Stockholm with a sign reading “school strike for climate”. Following Thunberg’s example, thousands of young people from Belgium to Australia have taken part in strikes over the past few months. But this Friday’s event promises to be the largest so far — a global effort spearheaded by young activists in each country and through social-media hashtags such as #fridaysforfuture and#YouthStrike4Climate. Thunberg has become the figurehead for the youth protests — an expression of anger at adults’ inaction against the climate crisis. “You say you love your children above all else, and yet you are stealing their future in front of their very eyes,” she said in a speech at the 2018 United Nations climate conference in Katowice, Poland. Not everyone is so enthusiastic about the strikes. 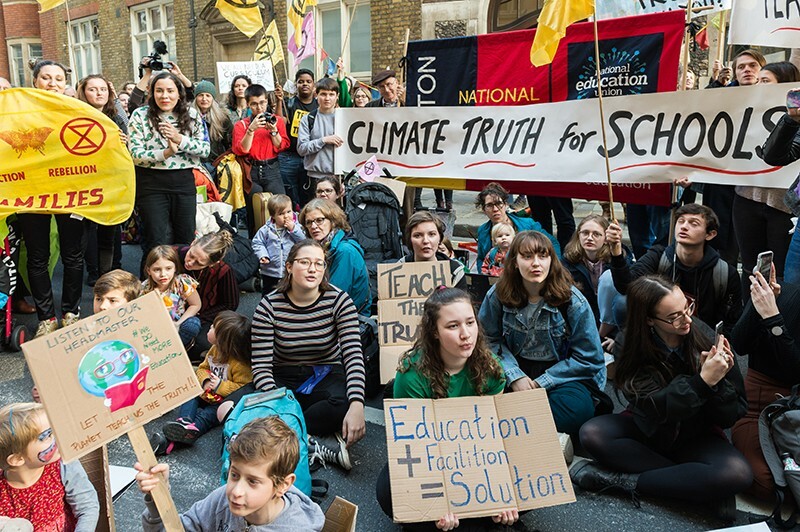 Some politicians — including UK Prime Minister Theresa May — and school leaders have expressed concern that the protests are interfering with children’s education. “While we support the right of young people to express themselves, first and foremost, pupils should be in school during term time,” said Sarah Hannafin, senior policy adviser for the United Kingdom’s National Association of Head Teachers, in a statement. School leaders can’t condone children missing out on education, she says, and schools provide a safe platform for teaching children about positive social action. Whiteman is surprised by the “stuffy” responses of some of those objecting to the strikes. “Education happens in many places,” she says. Teachers could use the moment to discuss relevant aspects of literature or history with their students — who are making history themselves, she says. Hoque, who also attended a strike in February, says that her teachers are backing the students, and have even asked them to tell the class about their experiences when they return to school. “Young people can be the motivators, but at the end of the day, we don’t have the ultimate power. It’s the policymakers,” she says.